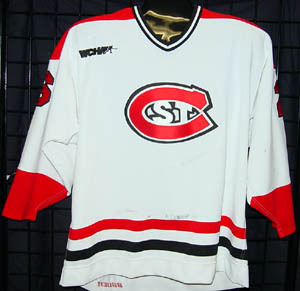 Description: 98/99 game worn St. 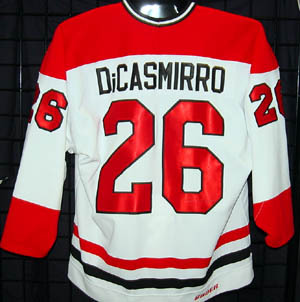 Cloud State University hockey jersey, worn by Nate DiCasmirro, Bauer solid knit home, size 54, shows nice game use, DiCasmirro signed as a free agent by Edmonton, May 28, 2002, In 99/00 he scored 19g-24a-43pts and 26 PIM, 19 goals stands as sixth most in a single season at St. Cloud State.